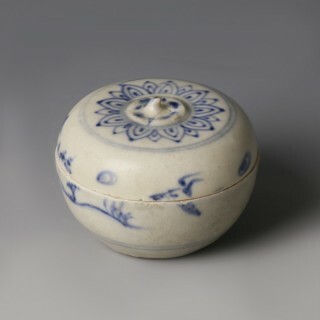 A small molded blue and white covered porcelain box. Decorated to the top with a central floral medallion with a raised button centre from which radiate conjoined petals. Side decorated with landscape-type design, all above a double line around the base. This porcelain comes from the Hoi An shipwreck, sank in the late 15th-early 16th century. Fishermen discovered the wreck in the early 90s, in the open seas off Cu Lao Cham Island, known as the most capricious waters in Vietnam. The government soon realised the importance of the cargo and got involved, ordering underwater excavations (1997-1999). Indeed, more than 150,000 objects were found. Produced in the middle 15th century, these ceramics come from the Hai Duong province (North Vietnam), which is known to be the biggest production centre of ceramics and porcelain of medieval Vietnam. At that time, the Ming dynasty in China decreed a ban on maritime exports to Southeast Asia and other countries, leaving the opportunity for Vietnam to foster its ceramics and porcelain production. 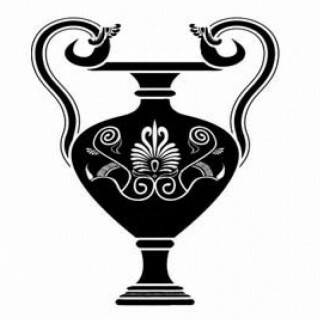 Ceramics from the Hoi An Hoard are nowadays known to be the most precious and complete representations of Vietnamese artisanship in glazed ceramics.